Daveswordsofwisdom.com: Surviving a Heart Attack whilst alone - PLEASE READ. 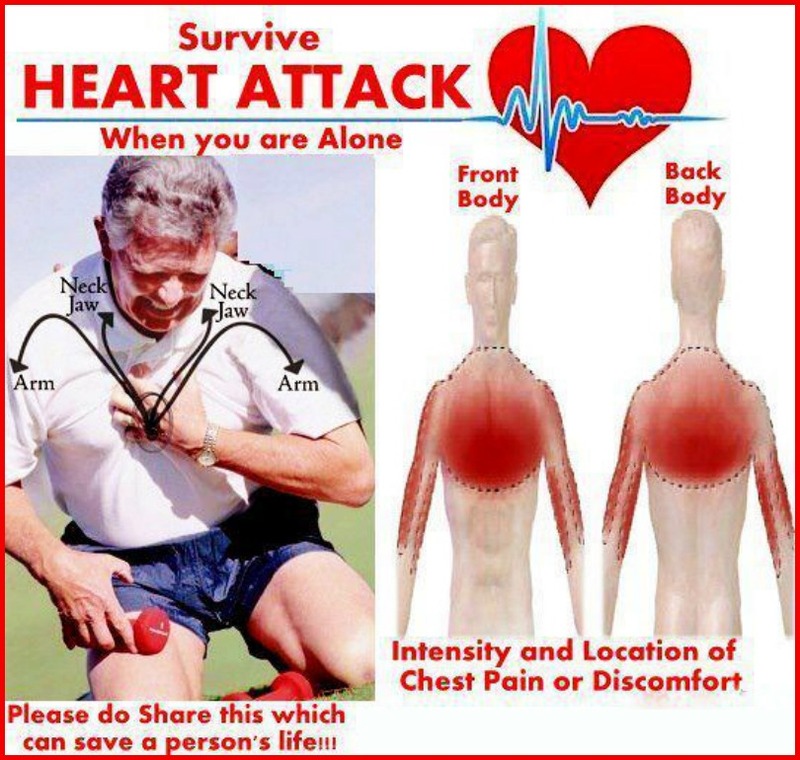 Surviving a Heart Attack whilst alone - PLEASE READ. ...after an unusually hard day on the job. You're really tired, upset and frustrated. Suddenly you start experiencing severe pain in your chest that starts to drag out into your arm and up into your jaw. You are only about five miles from the hospital nearest your home. Unfortunately you don't know if you'll be able to make it that far. You have been trained in CPR, but the guy that taught the course did not tell you how to perform it on yourself..!! NOW HOW TO SURVIVE A HEART ATTACK WHEN ALONE.. Since many people are alone when they suffer a heart attack, without help, the person whose heart is beating improperly and begins to feel faint, has only about 10 seconds left before losing consciousness. However, these victims can help themselves by coughing repeatedly and very vigorously. A deep breath should be taken before each cough, and the cough must be deep and prolonged, as when producing sputum from deep inside the chest. A breath and a cough must be repeated about every two seconds without let-up until help arrives, or until the heart is felt to be beating normally again. Deep breaths get oxygen into the lungs and coughing movements squeeze the heart and keep the blood circulating. The squeezing pressure on the heart can also help it regain normal rhythm. In this way, heart attack victims can gain valuable time, hopefully call for help and get to a hospital. Makes good sense to me - why does grandpa9588 see it as BS? Where is the medical back up for this? I spoke to a medical health professional after reading this and they said forcing a cough increases stress on the heart which could worsen the symptoms. Doesn't have to be a heart attack. I have rhythm problems that can get me down and I've used this method before to get back into rhythm. Call BS on it after you try it not before turning someone away from something that could save their life. Can't get more childish than that. This was debunked years ago. People are so gullible. Fake news. Thanks for posting Snopes' thoughts on this. - heart attack is a fixable problem, cardiac arrest much less so. Get to the hospital before you go into cardiac arrest and your chances of surviving are much, much better.